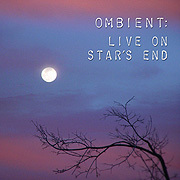 Multi-instrumentalist Mike Hunter uses the name Ombient to make live music to fit any situation. 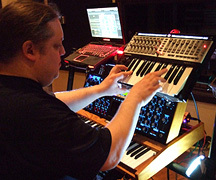 During his many concert outings he has played electric guitar, touch guitar, looping and processing devices, classic analogue synthesizers and computer software to realize a range of performances - from those of great portent down to something more ethereal, diffuse and atmospheric. His album Live on Star's End 03.11.12 (57'22") was produced and recorded live on the air - and finds this artist once again creating a set of music meant to fill up the listening space of a particular environment. Presented as one long piece this work opens with a fascinating and well-designed dronescape, which incorporates layers of deep tones - each possessing its own well-crafted set of harmonics. Above these sonic undulations Hunter plays intermittently some well-chosen reed/synth hybrid notes. As the focus sharpens and the mood builds a churning sequencer pattern emerges. The mechanistic repetition of soft echoing patterns puts everyone in the audience in sync with one another. Soaring arches of melody provide variation amidst the minimalist rhythmic pulsation - which run on then ingeniously change length, direction and contour. The overall feel is that of warm old electronics, with filters snapping and sweeping down wide. But Hunter also has fabricated more advanced sounds, leads, drones and effects obviously derived from samples or acoustic sound sources. Extended resonating metallic emanations fill out the low end as a breathy flute-like digital rendering becomes interwoven into the fabric of this design. Mike Hunter uses music technology to work against the fragmented thought processes of modern culture. His most linear work is an internal discipline based on all the complexities of the individual. He is not focused on the destination of this musical voyage, nor the facts of the journey, but on the simple act of moving through space.